Yay, it's Spotlight Small Press Week!! I'm very excited to help put the spotlight on another great small press publisher this week, and I hope by May 22nd, you can all immediately recognize the very distinctive covers that New York Review Books Classics has. As I already told you why NYRB Classics is absolutely amazing in my post yesterday, I shall get straight to my review today. I chose to review two books for this Spotlight Series, and the first one is An African in Greenland. Sometimes, when browsing books online or in a store, I come across one with a very catchy title and must immediately take it down from the shelf (or click through, if it's the internet) and learn what it's about. That was exactly the case with An African in Greenland (and the other book I chose to review). What an intriguing title! And it was definitely an intriguing book as well. 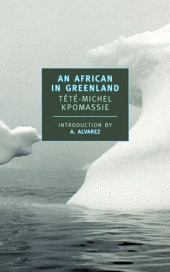 An African in Greenland follows Tete-Michel Kpomassie on his journey from Togo to Greenland in the 1950s, and then from the southern part of Greenland to the northern part. Kpomassie was 16 when he came across a book on Greenland and decided that he must travel there. He set off with remarkable speed on this journey, spending eight years trying to get from Togo, through northern Africa and Europe and then ending up in Greenland. There, he spent a year living with the Inuits, learning their culture, and thoroughly enjoying himself. This book was good for none of the reasons I originally expected. I thought it would be more about the cultural differences between Kpomassie's life in traditional Togo and the lifestyle he adopted in Greenland. He doesn't do much of this at all; rather, he presents Inuit culture mostly on its own, and comments on it as an outsider, but not as a representative of a very different culture. I also thought there would be more about his route to Greenland. He skims over most of his travel until he gets to Greenland. That's fair, as the book is about an African in Greenland. But the glimpses we have of his life in Africa and Europe seem so interesting that I'm sad we didn't get more of those stories. I also expected a bit more introspection. For example, it seemed very much like teenage rebellion against his prescribed way of life that made Kpomassie want to leave Togo and go as far away as possible. But it must not have been because he spent eight years trying to get to Greenland. He then says at the end that he would leave Greenland so that he could teach the Togolese about the Inuit culture. But... why? What would the Togolese learn from people who lived in such a completely different extreme than they did that required Kpomassie to go back and teach them? I didn't fully follow that train of logic and I wish that Kpomassie had shared more about what happened when he returned home and shared his knowledge. However, I did find a lot to fascinate me in this book. The author has a very engaging style of writing, and I was never bored, even when I read about multiple meals of bloody whale blubber and raw seal. I think this is because the Inuit culture is so very different from any I have come across. As they don't have trees on Greenland, fire wasn't part of the culture; thus, most food is eaten raw. The people also drink a lot. All the time, in fact, and often to the point of being dangerously drunk. Family life seems more ruled by children than by adults (I believe because adults become expendable quite early, when they can no longer hunt) and there was a lot of spouse swapping. I came away with a somewhat disturbing impression of life in Greenland- that the people were generally pretty unmotivated and listless. It is similar to the very depressing impression I have of life on a Native American reservation and I don't think the comparison is unfair. Greenland is part of Denmark, and it seems the Danes treat the Inuits like second-class citizens, while also offering many hand-outs so that the people don't have to work that much to survive. It seems like a system designed to fail the Inuits in the long-term. This saddens me because the Inuit were so hospitable. All Kpomassie had to do was arrive in a village and ask the first person he met for a place to stay, and that person acquiesced immediately, even though he and his family might be very poor and live in a fairly ramshackle place. They share everything in Greenland, and this definitely worked in Kpomassie's favor! I am not sure how he contributed to the household expenses of any of the places he stayed in. He was fairly vague about that aspect of his trip, and I am not sure how much of a freeloader he was. He seemed to get money from someone in Europe, and then he would spend money in Greenland, but while he was involved in a couple of hunts, he did not seem like he was doing much to earn his keep. He did, however, fully participate in the hard-drinking, lots-of-eating and fairly promiscuous lifestyles of the Greenlanders. While I don't know if I liked Kpomassie as a person, I think his writing style is very engaging and I enjoyed learning more about such a foreign culture (even if it was not at all what I expected to learn). For that reason, I would recommend this book, but I do wish there was a sort of prequel, in which we learned more about Kpomassie's adventures on his way to Greenland, through Africa and Europe. This review was done as part of the Spotlight Series. See the full schedule for the NYRB tour. From reading your review, I think I'd like to read a prequel as well. The book still sounds interesting though. This sounds like a very interesting book. I love learning about other cultures. And yes, like in many countries around the world, the indigenous population has not been treated very well. This sounds very intriguing and different! A small correction to your review - the Dutch are from the Netherlands and the Danes are from Denmark. For some reason a lot of people mix up the Swiss and the Swedes as well! He sounds like he took to the life with great gusto! What a fabulous find. I definitely want to read it. This is the type of book I crave. Interesting book. I also am confused about why Greenland? What would he teach when he got back? Why is it relevant? Etc. I also feel, from the sounds of it, that he paints a rather extreme view and I would be curious to know if that is the case in all villages there or just where he was? Or if that is what he say rather than the general norms? I wonder because although I have no background to Greenland's Inuit population my sister lives in Northern Canada and her boyfriend is half Inuit so she is quite immersed in their culture and it seems, although similar in ways (hard drinking, sharing and kindness, for ex), quite different in others (elders are very much respected, people often have a lot of drive and do a lot of fishing and hunting, for ex). When I read about Greenland back in March, they talked about some of that depression and listlessness. My book didn't go too much into it, but it seemed to be a very prevalent undertone. Thank you soo much for this review. I think I wold love this book! I am definitely going to look for it. "While I don't know if I liked Kpomassie as a person, I think his writing style is very engaging and I enjoyed learning more about such a foreign culture (even if it was not at all what I expected to learn)." I love that you separate out these ideas in your reviews; it's frustrating when readers equate their need to like a character/narrator with the book's worth. Often my favourite reading experiences are those in which I was unexpectedly engaged in a tale which took me somewhere unanticipated. H,, I just do not know if I wanna read it. Iris- Yes, I wish there had been more! I would have been fine with just a longer book, too. Zee- I agree, it was a fun read! Marieke- Thank you for that! I don't know why that always confuses me, but it does! I don't think I mess up the Swiss and the Swedes, though :-) So far, anyway. Chris- Yes, he seemed to have very little trouble assimilating! Vivienne- I think you would really enjoy it. Maybe after you finish your tour of the 50 United States, you can take to the Arctic? Amy- That frustrated me a lot, too. I just wish there had been more depth in the story. As for his view of Greenland- I don't know! He visited several villages from the south all the way to the north so I think he had pretty good exposure to the culture. He did say people in the North hunted a lot more than those in the south. I think the elders thing is interesting that you point out, but I think the other differences may have more to do with the Danish treatment of Greenlanders vs. the Canadian treatment? Amanda- I think I told you, I was thinking of you when I was reading this! itsJUSTme- I hope you find it! I love that a book like this EXISTS, if that makes sense. Buried in Print- Thank you! I agree that can be frustrating as I often like a book but don't like characters. For example, that just happened when I read Shortcomings as well. I like being engaged more than being in love with a character. Blodeuedd- Yes, I think the culture is dying a bit, which is sad. He mentioned that now, almost all their culture is imported from Europe instead of home-grown. I know so little about the Inuit population that this seems like a really interesting book in which I could learn more about them. It is sort of disappointing that more of the information about his journey was not included, but it sounds like there were several intriguing aspects of the story that may have made up for it a bit. Great review, Aarti! I am really glad that you brought this book to my attention! Aarti - Things are likely quite different in a variety of ways between Greenland and Canada, but it did stick out at me. Sounds great! Fascinating book! I am amazed that there is still a civilization that does not use fire. Wow! I would love to go and study them. I would love it if he had written a prequel as well. 8 years to get to a place definitely asks for more! What small press was this? Trapunto- I hope I fixed all those horrible cultural faux pas now! Yikes. I wonder if things have changed, too. It would be good to see some sort of epilogue, but there wasn't one and I'm not sure if another story similar to this one has been written more recently that isn't academic in tone. Zibilee- There was definitely a lot that WAS in the book that I liked, though I would have loved it to just have a LITTLE more- another layer. Amy- I wonder about that now, too! Maybe it's different culture, as well? I don't know enough about Inuits to comment! Aths- I think they use fire now, on stoves and such, but they mostly don't cook their meat (from what I could tell, traditionally). Shannon- The small press being featured this week is NYRB Classics. That's so sad that the Inuit culture in Greenland is in a similar state than what we heard about from Native American or First Nations reservations :\ Not surprising, but still saddening. But though that aspect of it would depress me, this sounds like an absolutely fascinating book! Something about every NYRB book seems so appealing. I mean, in terms of their physicality, I think they are perfect. But in terms of content, I find they can be really hit or miss in whether I like (or even understand) them. The book club I'm a part of reads mostly NYRB books, and I've found that I get sooooo much more out of them after our discussion. And generally, I think this is the goal of NYRB on a whole. These books are all very different and have unique settings and characters; and as a result, they're probably not going to be completely relatable to a large audience. But they're great discussion pieces and have a LOT to them. I like the sound of this - something different and it's always interesting to read about other cultures. We had an Inuit shaman speak at a group a few years back and he was fascinating to listen to. When I checked out the NYRB catalogue I was in lust...so many wonderful sounding books! I can't imagine making a cultural let alone physical journey like that. I think I'd enjoy the book. This sounds like such an interesting book. Thanks for bringing it to my attention. I added it to my TBR. I know so little about Greenland in general, I'm afraid. This does sound like an interesting book offered from an interesting perspective.